In Eridu, MARDUK is actually not attributed among the Anunnaki gods – not listed among the pantheon – by Sumerian standards. In fact, MARDUK is initially the primary high-ranked leader of IGIGI (Watchers), setting a status quo in Eridu – and then in Babylon – concerning the intermarriage between Anunnaki with humans (as described on the ancient cuneiform tablets). For this ‘indiscretion’, by Enlilite ‘World Order‘ he was denied his Divine Right, but his argument remained that it was never going to be given to him anyway and that MARDUK’S chosen consort, SARPANIT, mother of NABU, was actually of royal blood by ENKI (being a seventh generation descendent of Adapa, a hybrid born of direct genetics from ENKI). Following a dramatically unsuccessful campaign earlier in Sumerian history c. 3650 B.C. – an archetype in human consciousness called the ‘Tower of Babel’ incident – the Enuma Elis program is officially installed c. 2150 B.C. by the Mardukite Nabu-Priests in Babylon (Borsippa). Archaeologists first became away of this particular series in 1849 when cuneiform tablets were recovered from an expedition into the ‘Royal Library of Ashurbanipal‘ in ‘Nineveh’. Contents of the tablets were first published academically in 1876 and received significant attention by historians, mythographers and biblical scholars – not only because of their antiquity, but because of how significant the work turned out to be in deciphering the ‘methodology’ of Babylonian civilization and religion in addition to its high resonance with our contemporary and ‘classical’ “Epic of Creation” given in the Judeo-Christian Book of Genesis. Although the text of the ‘Enuma Elis’, appears in the original Year-1 cycle of Mardukite work, the cycle is more closely analyzed in the Year-3 cycle discourse, NECRONOMICON SPELLBOOK I, wherein it explains how multiple versions of ‘Mesopotamian-originating’ tablets exist – but there is one key point that many esoteric practitioners and historians miss when appropriating what ‘purpose’ the tablets have within the ‘greater’ tradition – the ‘bigger’ world picture. 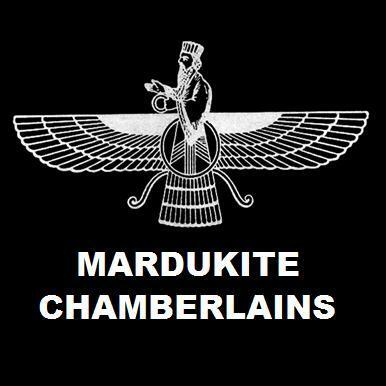 …for Mardukites, the Enuma Elis made this all possible for their own elevation of MARDUK and the development of Babylon as the earthly seat of godly power!